We’d done a walk with a couple of other people to Hampton Court and had planned to carry on to Hersham. In the end that turned out to be a bit optimistic so we didn’t. We knew nothing of Hersham except that Sham 69 wrote a song about it. 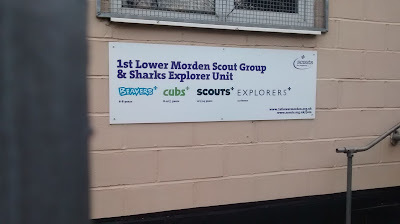 Morden was a place I knew only as the southern terminus of the Northern Line. It looked within walking distance of Hersham on the map- roughly 12 miles- so it would do nicely as a starting point. Outside Morden Tube station only hint of the rampant hipsterfication found elsewhere was at the Wimpey. where their usual fayre is now being offered on wooden boards instead of plates. 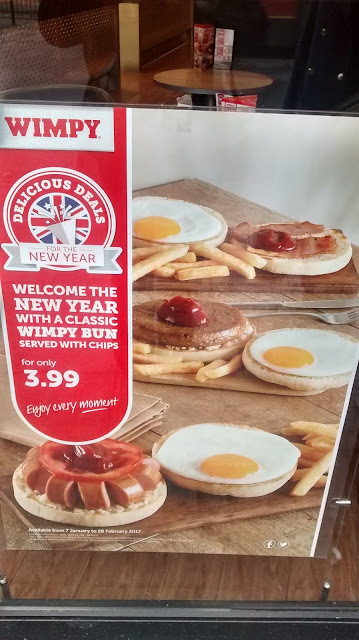 The ‘bender in a bun’ looked more vile than ever being half exposed. Coincidently the day after the walk an article on Wimpeys appeared here. The franchise owner of a Wimpey interviewed says he’s eaten it every day for 31 years. With the at least 3 grease cafes in the vicinity we weren’t tempted to start following his example. South London -which I’m less familiar with - often feels a bit like a parallel version of North London. 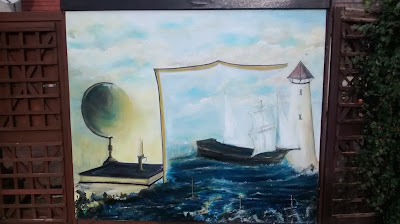 A bit off kilter, like a place in a dream that’s supposed to be somewhere you know but isn’t quite right. 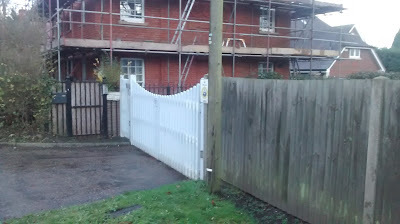 One feature we noticed here and on a previous walk following the Wandle is more extensive suburban-ness. The endless 1930s pebble dashed and mock Tudor houses reminded us of the settings for 70s sit coms. We wondered about mapping locations of London based sitcoms across the city. 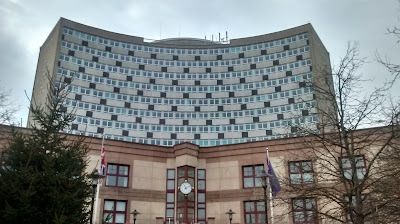 The Civic Centre in Morden is a quite bizarre building incorporated into a curved block of flats or maybe offices. I could imagine it as a scene in the (probably deservedly) forgotten 80s comedy ‘a Small Problem’. Writing this a few weeks after the walk, looking at my photos for the next part of the walk they seem out of sequence with the way I remember it. Not sure if it’s the technology at fault or my memory. I’m going to blame the technology and relay events as I recall them. 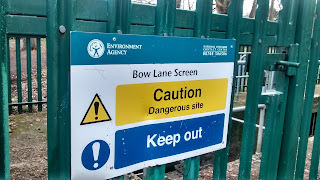 We passed the Morden Brook – the first pub we had seen but it was a bit early for a pint. 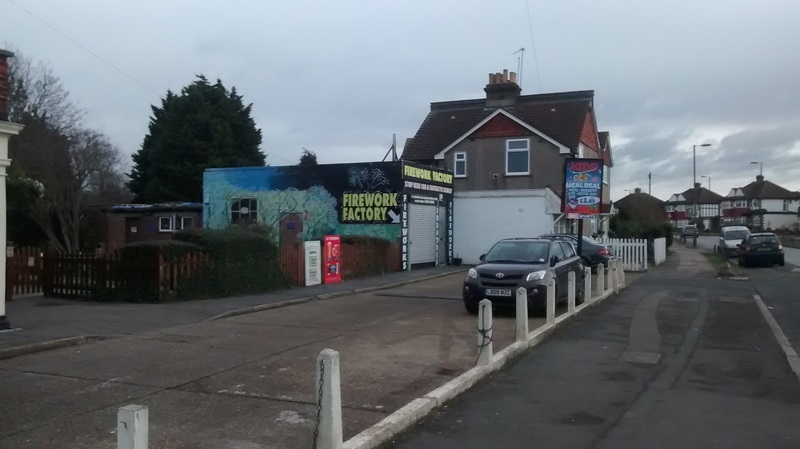 Nearby was something called ‘The Firework Factory’. Not sure if it had any connection to the one that exploded in Southampton back in May last year but we thought it best not to hang about. We went past this odd painting/mural in someone’s front garden just before Morden Cemetery. There’s obviously a nautical theme but beyond that it made no sense. Morden Cemetery was pleasant enough but I have no significant memories of it. We came out into a park which I think was the Sir Joseph Hood Memorial Park. A quick google search reveals it’s named after a Tory from Ashby De La Zouch- a place I’d previously only associated with the character Adrian Mole and have visited with my work. It’s got a good Thai Restaurant and no train station. 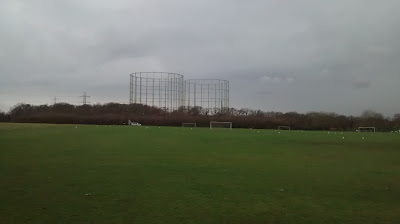 From the park we could see the three gas rings- a dominating feature of the area of Motspur Park. R and me are a bit to old/cautious/worried about getting nicked to embark on any closer inspection but others have been a bit bolder (it’s a young man’s game!) and some closer views are available here. 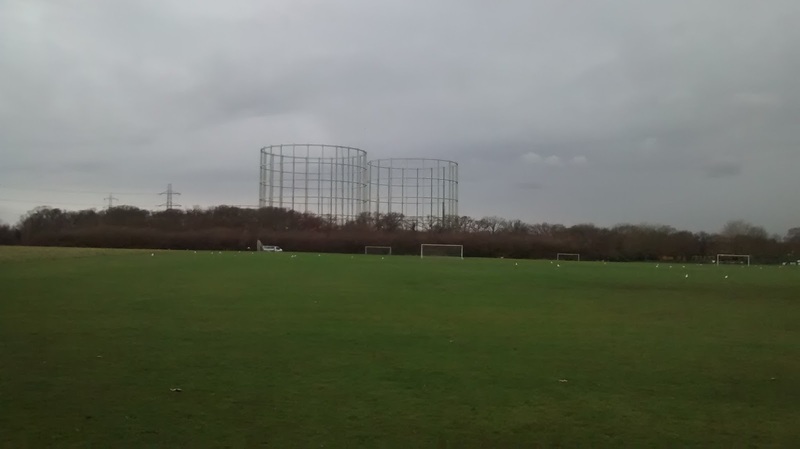 The area Motspur Park was apparently the location of the sit com ‘Brush Strokes’. It featured a character called Jack played by a bloke who went on to be in adverts for Flash floor cleaner. And music by the bloke from Dexys Midnight Runners. More impressively -if true-apparently George Clinton of Parliament/Funkadelic lived in the area which trumps Merton’s third division Mod Revival musical connection hands down. Back on a main(ish) road we passed pub number 2 – The Earl Beatty. Quite an impressive looking (from the outside at least) 30s style boozer. It’s claimed on the pub website that it’s in New Malden rather than Motspur Park. 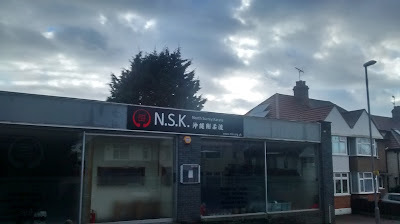 New Malden is famous for its Korean restaurants and has a large Korean community but none of that was evident here. We passed the gas rings again beyond a house as we crossed the boundary into Kingston borough. 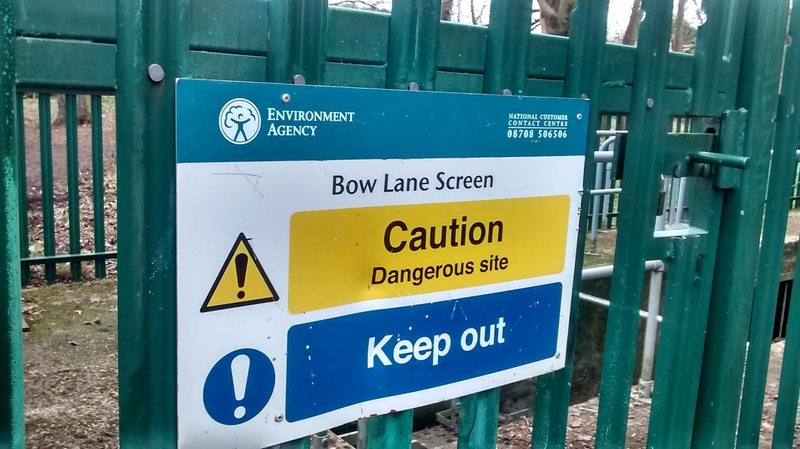 And at some point according to google maps we had passed over the first Thames tributary of the day, Beverley Brook but I can’t say I recall seeing it. 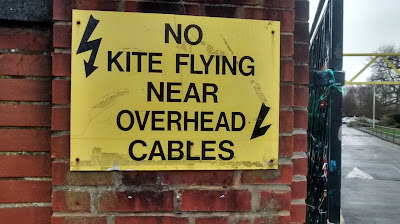 Manor Park featured a row of pylons following a railway track and this 70s public information film style sign on the gate. 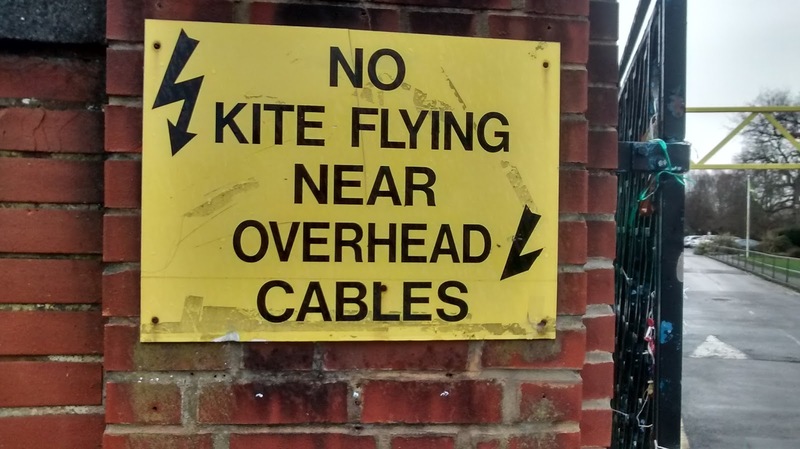 We saw no sign of small girls encouraging small boys to fly big Peter Powell kites near pylons and leading them to certain death. I’m not sure what this area is known as- the Park is cited as being in New Malden on some websites, Old Malden in others. 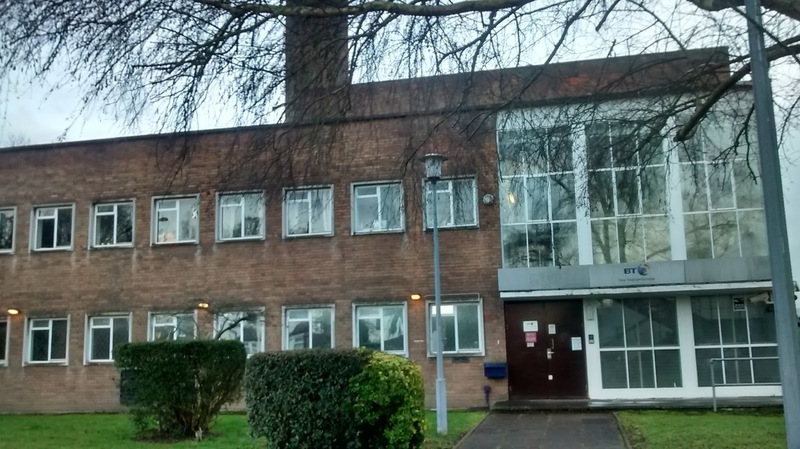 I found this from the ‘Worcester Park blog’ which suggests part of the park at least is/was owned privately and in 2013 being trashed deliberately to make whatever development was planned seem an attractive option. Where Worcester Park fits in geographically I’m not entirely sure. But soon we were somewhere defiantly signposted as Old Malden. Nearby was a green space through which the Hogsmill river flowed (second Thames tributary of the day). Maybe this was where the shark hunting scouts who’s hut we had seen earlier would find what they were looking for. Past here on a pretty unremarkable residential street we saw the trade van of the unadvisedly named ‘Splashback’ bathroom fitters. 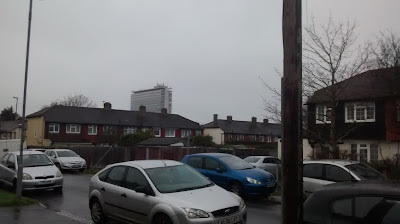 And in the distance loomed the Tolworth Tower. A quick google had revealed The Toby Jug pub had played host to some top names in the early 70s. David Bowie, Led Zeppelin, Atomic Rooster. It’s not there anymore. 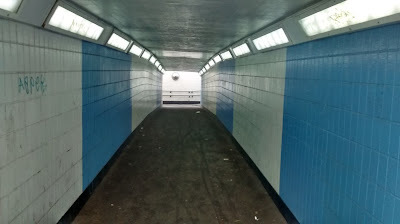 Just the other side of the underpass from where it once stood is one end of the Broadway. 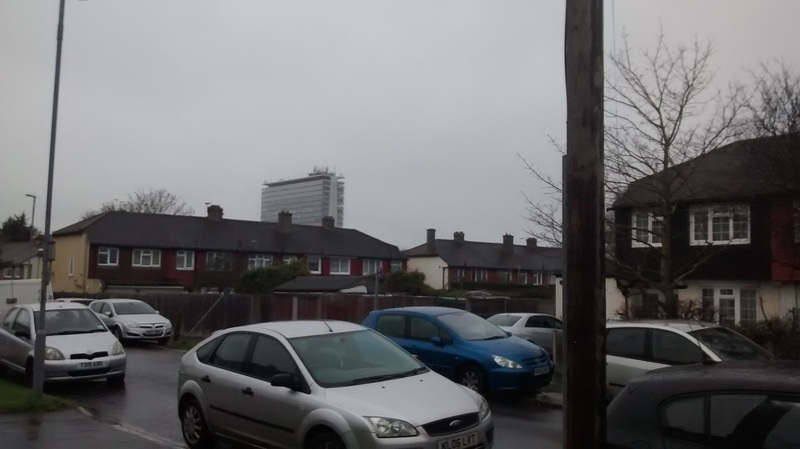 This is dominated by Tolworth Tower which is a shopping centre with offices above. 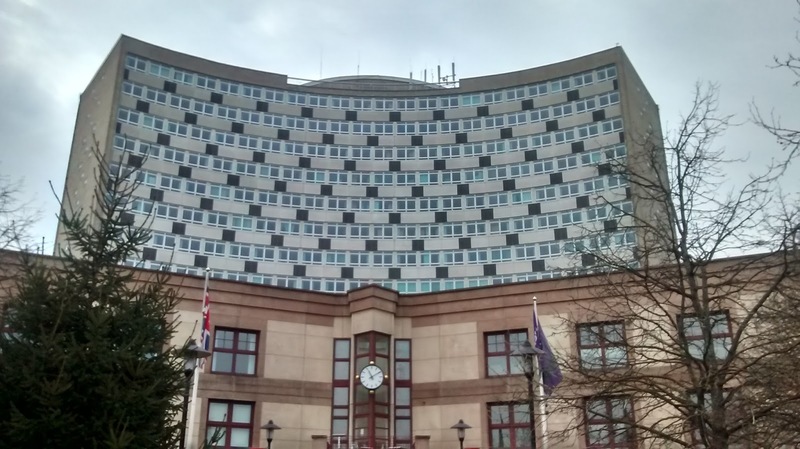 Its reminded me of a cross between a less sophisticated version of the JG Ballard’s High Rise and the hemmed- in- by- ring- roads location of the office in the film Bartelby. 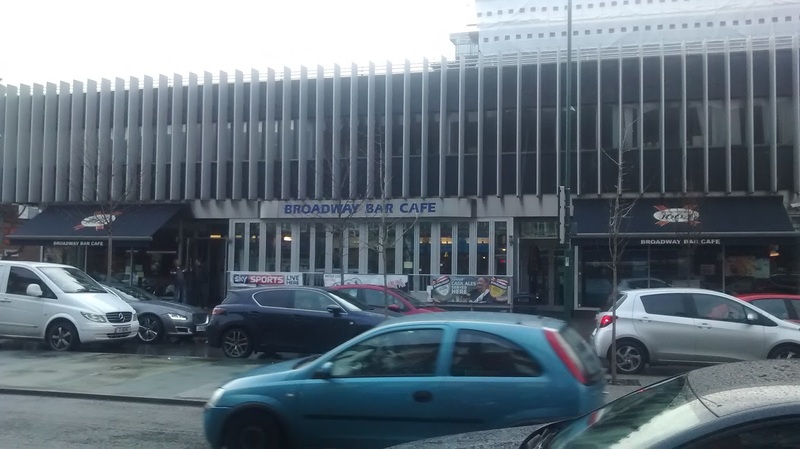 On the Broadway we passed the Broadway Bar café. We weren’t sure if this counted as a pub but given the depressing infrequency of them up to this point we called it pub no.3 of the walk. We stopped for coffee in an Italian café where the radio was broadcasting ‘Radio Jackie’. R was intrigued that a radio station should cater solely to the readers of a publication for pre-teenage girls It’s not- but a former pirate turned commercial local station broadcast from the Tower. We cut through some back streets. 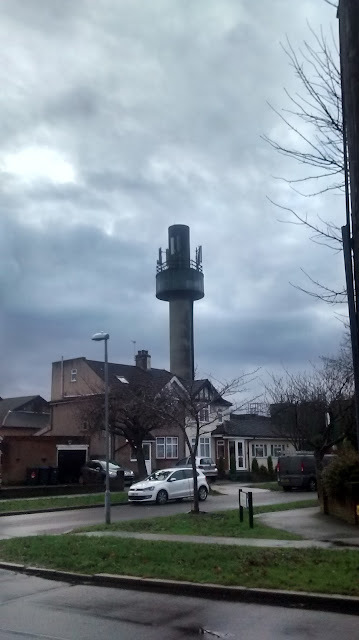 A sinister looking tower (hospital? we never found out) loomed over the roads of 1930s looking houses. Soon after passing a dilapidated offy we ended up back on a bypass and next to the site of the former Ace of Spades roadhouse. In the 30s Roadhouses allowed the middle classes the opportunity to drive to a large pub for food, drinking and dancing ‘til late before a drive home after a skinfull. Acceptable middle class drinking and driving is unimaginable these days-as is such an establishment being on this site. Now it is a row of shops including the Ace of Spades café. We were disturbed to see another establishment with links to fireworks. It was probably around 2pm when we got here and mysteriously everything was shut and the area devoid of people. We crossed the underpass across the A3. Not long after turning the corner near this establishment we were in what was beginning to look like the countryside. 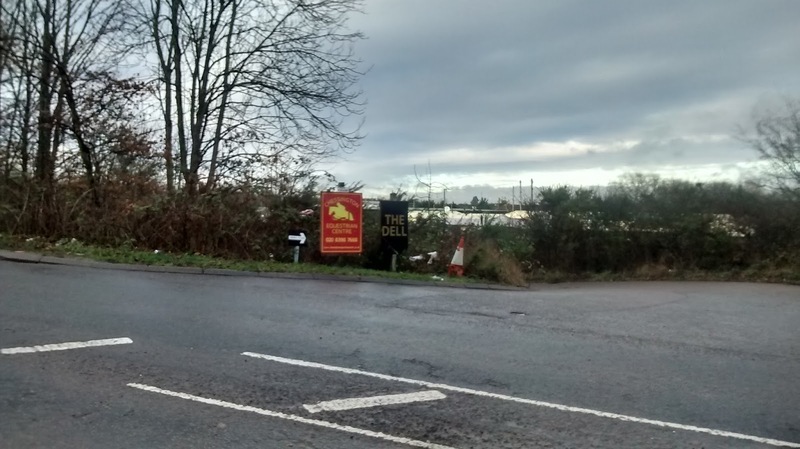 We passed the ‘Junior Livery Yard’ then Chessington Equestrian Centre and ‘The Dell’ which also featured a mobile home park. No sign of horses-only empty fields.There was a substantial amount of discarded beer cans, plastic bags and fag packets in the bushes opposite showing a particularly strong disregard for the country code. There was a lot more than could conceivably have been thrown from car windows we thought. A bit further along we were heading towards the village (suburb?) of Claygate - slowly- down a muddy horse track which was as close a thing available to a proper footpath. The sight of an abandoned mattress by the side of the road appeared to mark a proper boundary between town and country- and beyond this it felt like we had properly left London. 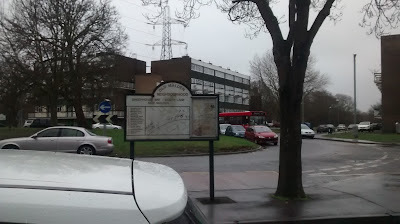 A sign pointed out ‘Cameras Operated by Elmbridge Borough Council’ and we were now off the (A-Z) map. 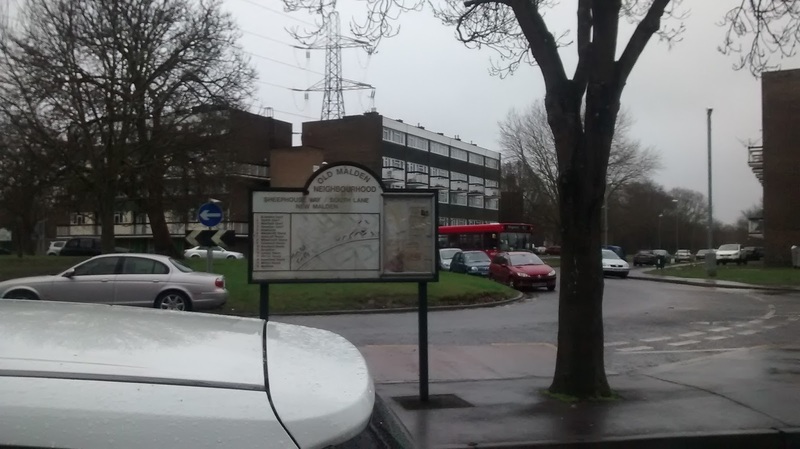 I’d never heard of Elmbridge Borough or it’s council but having passed their sign we began to feel like we were somewhere we might not be allowed to be. 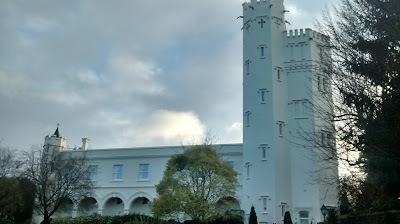 The proximity of Sandown Racecourse close to the nearby village (suburb?) of Esher sort of explained the paddocks/horsiness of the vicinity. But this changed as we passed the entrance to a Ruxley Heights- ‘PRIVATE ESTATE’ ‘NO HORSE RIDING’. 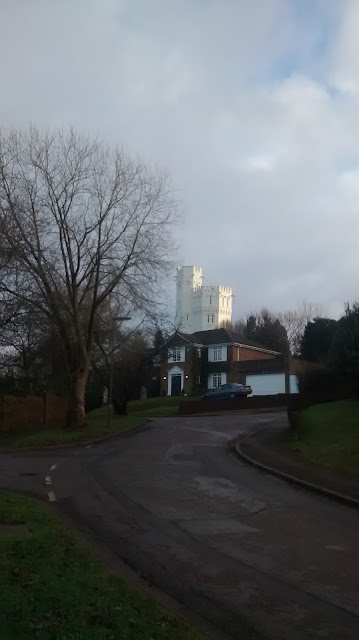 A bit further along behind some houses suddenly loomed up what looked like a bizarre folly or water tower. We took a diversion to get a closer look. The street/cul-de sac it was in was even more ‘private -keep out’ feel about it-we were surprised nobody came out of their house to ask what we thought we were doing or called the police. The building with the tower turned out to be a private residence – Ruxley Towers-which has associations with Queen Victoria, Cliff Richard and Ronnie Wood. The later apparently trashed the place leaving coffee stains and fag burns everywhere allegedly costing the landlord 75 grand. I wonder if the landlord was the same woman trying to sell it in this ever so slightly nauseating article from Surrey Life. R asked a woman walking two dogs how to get to Esher. This was a brave move on his part considering his usual relationship with dogs is one of allergic reactions and fear. The larger of the dogs growled and barked and had to be restrained. The woman clearly though we were of unsound mind and that Esher too far to go on foot (probably about two miles at most I think). This encounter as well as showing R had developed a previously unseen ability to remain calm in the presence of growly dogs, demonstrated the gulf in perceptions regarding a reasonable distance to travel by foot between us and most other people. This encounter did nothing to ease the feeling that we were intruders. A bit further into Claygate and in an area that looked less inhabited by the ultra-rich we asked a bloke for directions to the station. This seemed a better option than explaining where we were really going given the dog walkers reaction earlier. We needed water so asked if there were any shops-we’d seen none so far. He looked surprised and seemed a bit shocked-‘We’ve got loads of shops’. Before we saw any shops we arrived a Pub 5- The Foley. We crumbled at this point-thirsty and in need of a sit and a pee. On the way to the loo it was necessary to pass a large picture of the Queen Mother pouring a pint of Young’s Special. The pub was I think also a hotel, and was probably more somewhere that tolerated drinkers than welcomed them. Although they did well to tolerate the loud bloke with the Mike Read accent holding court at the bar. We only had to for the time it took to drink a half and relieve ourselves. 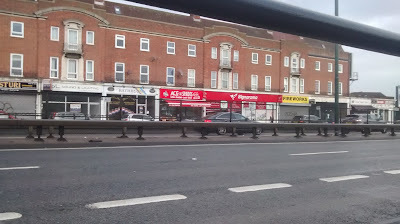 There were indeed several shops near the station-most on the upmarket side. They didn’t interest us much be we noted the bus stop that confirmed we were still in the London transport area. 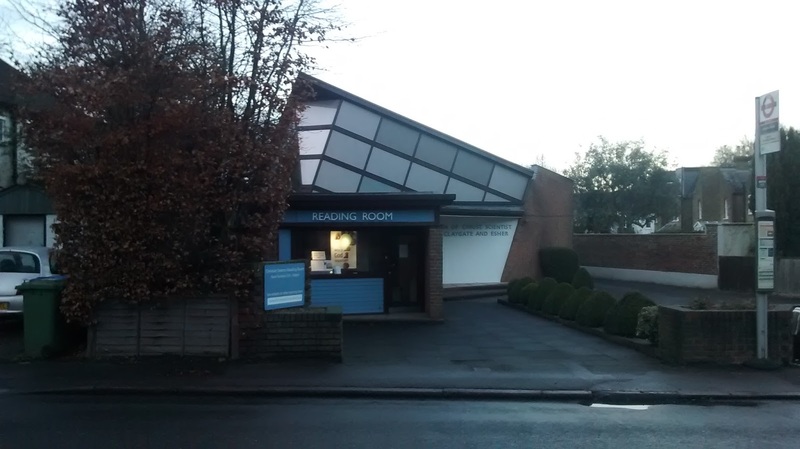 On the way out of Claygate we passed a BT Telephone exchange opposite a Christian Science reading room – an unusual building with another London bus stop out the front. The Christian Scientists believe illness is an illusion which can be corrected by prayer alone. While I’m not one to take headache pills and have avoided going to the doctors for about 15 years it’s only because I haven’t been I’ll enough to have to. When I’m inevitably succumb to the maladies of old(er) age it will be the doctors (or possibly Dignitas) that I will seek assistance from, thanks all the same. Soon after this we passed pub no.6, The Swan Inn, a telephone box (modern, not red but still a rare sight these days), and a white post bearing a London Corporation insignia. 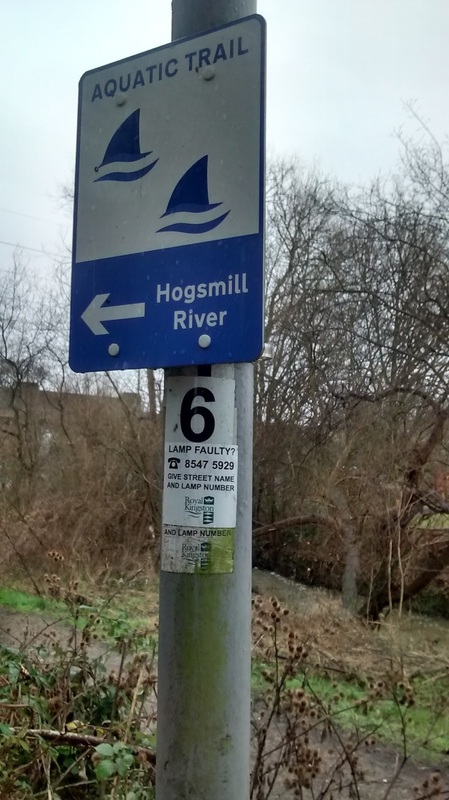 This puzzled us as we were at least 12 miles from the City of London. 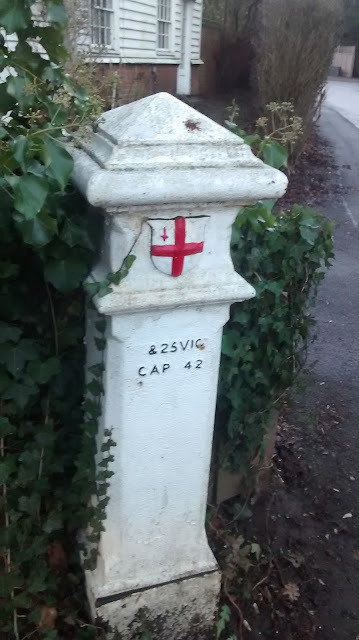 Not long after the walk a Londonist article appeared which explained this was a coal duty post-to do with the London and Wine Duties Continuance Act 1861. The Act is no longer in force but many of the posts remain encircling London. 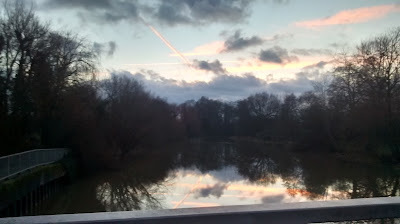 After Claygate we took a diversion through Claremont Park. 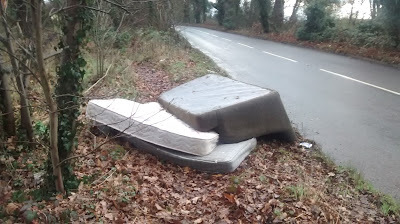 I had used the last charge on my phone to check google maps and this seemed a better option than the Esher bypass. There was no indication on the map that it was a private estate with a mini golf course, not a normal park. At the way out we could see a gate which appeared shut and possibly locked. It opened to let a car in from the other side and we made a run for it before it closed again. Just prior to this was probably not the best time to have been discussing ‘The Burglars Guide to the City’ which R had recently read. The place did have an air of somewhere the public were not allowed or were regarded with paranoid suspicion. But we might have just been a bit paranoid. We got out onto the main road unchallenged. Soon after this we passed Pub No7, Prince of Wales in Esher and then crossed a park to the River Mole. As it turned out there was no way to get across so we had to double back onto dual carriageway to get across. 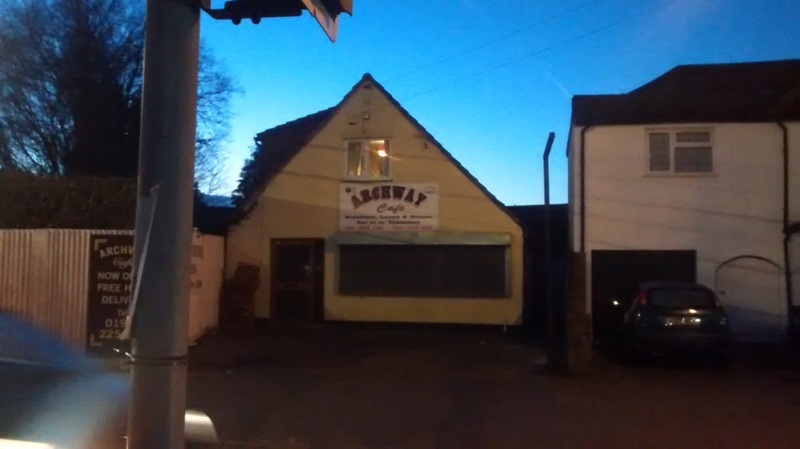 We finally reached the sign telling us we had arrived at Hersham as it was beginning to get dark. We reached the Barely Mow pub-only the 8th pub we had passed on a 12-14 mile walk. Musical entertainment was available in the form of Chinese Elvis Night in the restaurant across the road. Not quite Sham 69. We didn’t see much more of Hersham due to it being dark and because we needed to catch a train back into London to meet a mate. 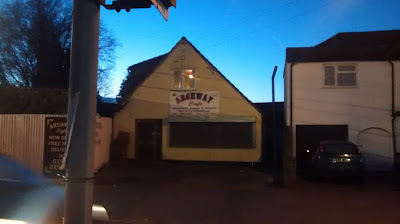 The Archway Café over the road from the Station looked like it would have been an ideal starting place had we done the walk the other way round-so maybe we will return. I've undertaken a series of sporadic walks across London over the last few years accompanied by R. R blogged about a couple here and here some time back. London is an obvious place to walk for us. It’s size and density allows endless routes with endless possibilities for random diversions and tangents. Also from a practical point of view it’s easy to get to on the train from where we live (Cambridge), the public transport system allows for catching random buses or trains to go off on tangents and for ease of return home at the end. It has plenty of places to stop for food and drink and sheltering from heavy rain thus avoiding the need to plan ahead or carry anything much other than perhaps an A-Z for occasional reference. I decided it was about time I started a blog. I kind of wish I’d done it before as I memories of previous walks (or walk/place related thoughts) have faded and got somehow merged together. I’m not sure that’s a bad thing. There a danger that I might do future walks conscious of what I’m going to write about thus taking me out of the ‘now’ and making it more forced. On the other hand it will be fun to document them. I might try and recreate some of the old ones using whatever photos I have and piece them together. These will be less than perfect accounts both factually and in their coherence but maybe the better for it. I’ve also been doing walks and aimless wanders locally around Cambridge and anywhere else I get the chance to so will probably write about those too and other connected (and unconnected) things. When we started doing the London walks we had both been reading London Orbital by Iain Sinclair and were inspired by his writing and psycho-geography more widely. Interest in psycho-geography and walking in general has grown massively since then. I’d refer anyone to ‘Walking’s New Movement’ by Phil Smith (Crab Man) for the low down on this. I’m not an academic or professional writer though, I’m strictly very much the amateur doing for the fun of it. Associations, connections and random tangents and meanderings (physically and mentally) as well as odd/bizarre and interesting objects, sites and architecture are for me the positive sides of a good walk. As well as free exercise without thinking about it (much) and the mental feeling of wellbeing a walk can generate. It’s impossible not to notice things like gentrification, privatisation of public space and the ever-growing presence of chain shops/hotels/etc. These things could in the end dramatically reduce the pleasure and even possibility of going for an urban wander but until they do and while my legs still work I intend to make the most of it.